I spend a lot of my time coaching individuals, teams, and organizations interested in reaching higher levels of performance through the use of Agile methodologies like Scrum, Kanban and SAFe. Some clients expect me to tell them what to do step by step, while others are interested in learning how methods work so they can determine what practices to use as their circumstances evolve. The approach that leadership teams prefer usually reflects the problems they are trying to solve, as well as their domain of expertise, their size, their culture and their organizational purpose (for-profit, non-profit, government, etc). In conversations with leadership teams, we discuss patterns and practices they could help institute or amplify in order to sustain their Agile transformation journey. Our message, reinforced by all success stories in the industry in the last 15 years is clear: The success of an Agile transformation, regardless of the practices adopted, is directly proportional to how well people in leadership roles at all levels understand, exercise, and constantly improve their Agile mindset. Leading with an Agile mindset means letting go of the traditional notion of leadership as strategy and control from the top according to a pre-determined plan of action. In times of rapid change when high levels of complexity and uncertainty are the order of the day, leaders can no longer assume they can know or control what goes on. Individuals at all levels must adapt constantly to changing conditions using their best capabilities and judgments in the moment. Leaders in Agile organizations understand that coaching creates a learning environment where individual and collective challenges are the first priorities. Coaching skills enhance their management tool-set in a way that benefits themselves, their staff (those who are coached), and their organizations. Trust has been defined by some as the ability to be vulnerable (Schooman, Mayer, and Davis, 2007). Implicit in this definition is the assumption that when you trust someone, you’re willing to be open, less guarded about your weaknesses and more candid about your opinions and ideas. And in Rhetoric, Aristotle, 384-322 BC), suggests that Ethos, the Trust of a speaker by the listener, is based on the listener’s perception of three characteristics of the speaker: competence (correctness of opinions), character (reliability – a competence factor, and honesty – a measure of intentions), and the goodwill of the speaker (favorable intentions towards the listener). When a manager uses a supervisory approach, the relationship between the manager and their subordinates is based on expertise. Boundaries are strictly maintained. Trust, while relevant, is not a key component. The relationship is embedded in the hierarchy of the organization. When managers coach, the relationship between them and their subordinates is based on both expertise and on abundance of trust. Subordinates trust their managers to do the right thing for them, for themselves, and for the organization. Samuel B. Bacharach, director of Cornell University’s Institute for Workplace Studies conducted extensive research and wrote over twenty books on management, organizational behavior, and industrial relations. His research indicates that organizations that do not embrace a coaching culture perpetuate a static culture of inertia, bureaucracy, and control. In contrast, coaching is a characteristic of organizational cultures that value innovation, creative thinking, problem solving, growth, and change. In another study, C. Ken Weidner, an assistant professor at the Center for Organization Development at Loyola University Chicago, found that trust in the supervisor is associated with better individual performance. Trust is the foundation for coaching relationships. It is also the foundation for what you want your organization to become. 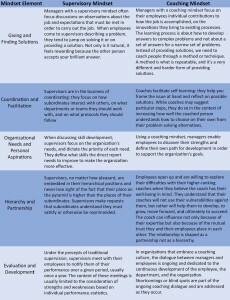 Both coaching and supervisory relationships exist within the hierarchical dynamics of an organization, yet they are fundamentally different. A coaching relationship temporarily suspends the hierarchical structure, and is a partnership based on the candid, free-flowing transition of ideas and information between coaches and their protégés, which serves to support, reinforce, and motivate both. Coaching holds that employees potentially possess the best answers to the problems they are faced with, and that the coaching process helps them discover the sources of those answers within themselves. “I suggest you complete your work in the order that you receive it.” – The supervisor focuses on coordinating work rather than facilitating it. “Since our last scheduled meeting, you’ve been doing a good job. Keep up the good work.” – This statement is an evaluation of job performance and is characteristic of a supervisory mindset. There is no suggestion of a plan to develop skills together or of a partnership, both hallmarks of the coach-employee relationship. “I understand the tight deadlines, the constant pressure from customers to provide the best service, and the intense competition that are all a part of your job. How do you think we can continue to improve the organization and ourselves given these conditions?” – This is a coaching statement. The speaker is empathetic and shows expertise regarding the current situation. The speaker indicates an interest in partnering with the direct report. “Working closely with you is very helpful, because not only do you improve on your abilities, but working with you also enables me to isolate those areas that seem problematic in general for employees in your position.” – The sense of partnership communicated here indicates a coaching relationship. “I appreciate your coming to me for assistance. It takes a lot for people to recognize their limitations and to know when they need to seek advice from others. In my experience, there are a few different ways we can approach solving this problem, so let’s work together to think of a feasible, realistic, and desirable solution.” – The sense of partnership communicated here indicates a coaching relationship. Mindsets like Agile Leadership and Coaching are critical to the success of an Agile transition in your organization. It takes practice to be good at them, and that means you have to go out there and do it. If, in the process of coaching, questions or challenges come to mind, we’d be delighted to hear from you. If you read this far, you probably enjoyed this article and I hope it stimulated ideas you can start using at work. I greatly appreciate your curiosity, and hope you stay in touch! Let me know if we should expand on this topic or if there are other topics that you would like to read about.